Stoke goalkeeper Asmir Begovic says he has buried his differences with manager Tony Pulis over claims the keeper went on strike. Begovic and Pulis had a public falling out in August when the manager said the Bosnian had refused to play in a Carling Cup tie against Shrewsbury. "We have moved on and everything is well now," the 23-year-old Begovic, who denied Pulis's claims, told BBC Sport. "You never know what can happen but I'm not looking to move anywhere." 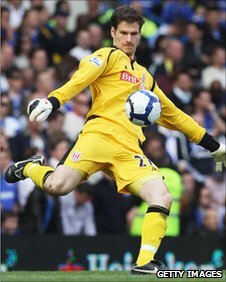 Signed from Portsmouth for £3.25m in February 2010, Begovic looked to be heading for the exit door in August when a dispute with Pulis led to the keeper and his manager exchanging public barbs. Pulis said Begovic had told him "he did not want to play" against the Shrews, though the Bosnian international retaliated by describing his manager's claims as an "absolutely disgraceful accusation". Pulis then suggested the goalkeeper's head had been "turned" by reported interest from champions Chelsea. Following the spat, Begovic had to wait until 27 October for a Premier League start, when an elbow injury to regular keeper Thomas Sorensen handed him his chance. Who should be Stoke goalkeeper? A series of impressive performances followed, with Sorensen having to be content with a place on the bench when he returned to full fitness in December. "Things are going really well," said Begovic, who had loan spells at Macclesfield, Yeovil, Bournemouth and Ipswich during his four years at Portsmouth. "I learned a lot from the experience. I'm enjoying playing, getting the experience and learning all the time. That's the sort of thing you want as a player. "I'm definitely very happy here at the moment playing and I want to be part of a good side here." Sorensen returned to the team as one of eight changes for Saturday's 1-1 FA Cup draw with Cardiff, but Begovic is confident he can hold on to his place in Pulis's full-strength side. "It's a challenge because Thomas is a very good goalkeeper, but hopefully I can stay in the side for a very long time," added the Bosnian. "I know I have to be at my best and I will strive to do so." Begovic grew up in Germany and Canada after his family fled Bosnia during the war. He made his international debut with Bosnia and Herzegovina in 2009 and has won four caps.